I have stumbled across this quote several times within the past couple of months and it has really stuck with me. I believe it can be applicable to all ladies, no matter how old or young you are. Actually, it reminds me of the Proverbs 31 woman. Though I am nowhere near the standards listed in that chapter of the Bible, I believe it’s something to strive for. I don’t know about you, but I’d rather be someone who is kind rather than coarse, a lady who is virtuous rather than vain, and good rather than greedy. Also, I would like my daughter to grow up as refined rather than rude, treats others with tenderness than with toughness, and chooses purity over popularity. 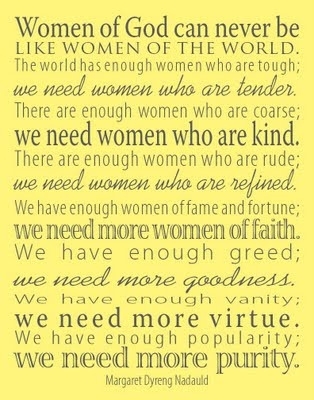 What kind of woman will you be? I do like this. Thanks for posting. I will show it to my daughter.